There’s a lot of music this writer would like to have been old enough to hear first time around. Elton John’s ‘Nikita’ is not one of those songs. Elton’s 1985 hit probably says something poignant about the Cold War and oppression behind the iron curtain, but to the casual observer it could appear as though he’s being chauffeured to a Communistical border post in a bright red Bentley just to mock those on the other side. Whatever, this neat Lego replica of Elton’s Bentley Continental convertible – complete with Elton himself – comes from previous bloggee Ralph Savelsberg aka Mad Physicist and it’s a superb recreation of the car (which was Elton’s own) from the music video. There’s lots more to see of the Bentley and Ralph’s other cars at his photostream via the link above, and you can try to work out what the hell Elton John is up to by clicking here. 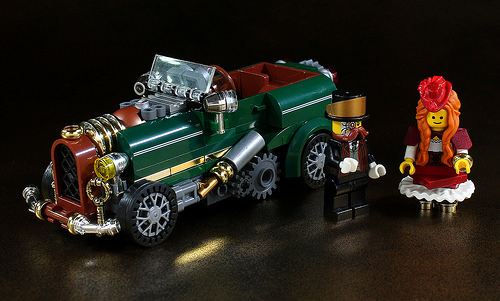 LegoGallifrey‘s ‘blower’ Bentley is not a new build, but it is superb, and it’s been recently updated to include even more period realism, plus – and most importantly – it allows us to post a smutty title. Built between 1927 and 1931, the Bentley 4½ litre was designed to take on the European performance cars of the time, and with a supercharger fitted (or ‘blower’ as it was known), power jumped by over 100bhp to 240, allowing Bentley to set several speed records, including a recorded 138mph at Brooklands. Only 55 of the 720 Bentley 4½ litres built received a supercharger and they command truly astronomical prices today, so if you want one LegoGallifrey’s version is probably as close as you’ll get. Head over to Flickr via the link above to take a closer look. We’re feeling quite lucky here at TLCB Towers. Having found a very nice Blower Bentley yesterday, we’ve found this British Racing Green, steam punk roadster today. Moko is its creator and you can see more of the car and accompanying mech on his Photostream and even more on his blog.